Two men, both carrying rattles and a fan, are shown in elaborate attire. There is a name glyph for each, but these have not been interpreted. The German text written on this drawing has been translated to read, “Ollie Johnson—daughter and grandson.” According to Barbara LaMont, this is partly incorrect, since the leggings and breechcloths of the two figures indicate they are males. 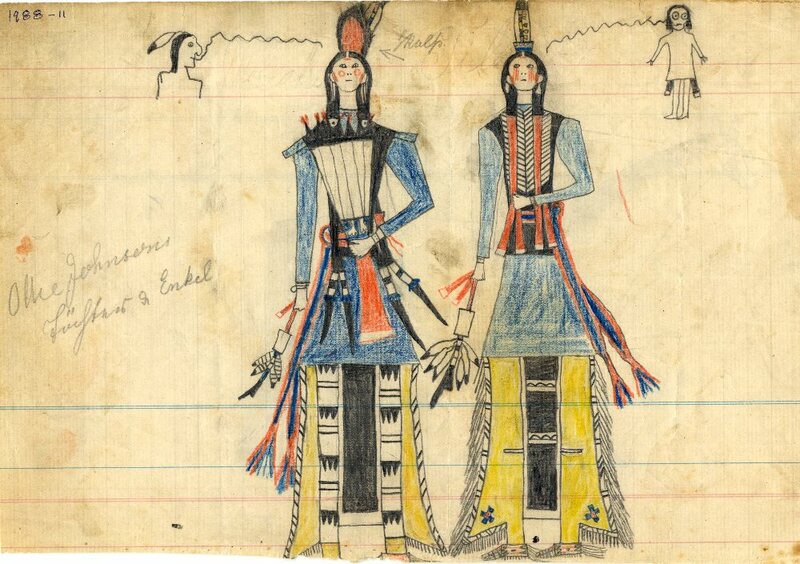 LaMont received further information from Kiowa artist James Auchiah who identifies the men as Kiowa gourd dancers. However, Father Peter Powell holds that the name glyphs and paraphernalia are Cheyenne, ca. 1880. TARL Archives.